Fendarfelle is a bold and uncharted frontier in the northwest corner of Aloria. Its volcanoes, formed during the major geographical disruptions of the Cataclysm, loom large from the core of the continent over a thick jungle fed by soil their eruptions helped form. The Regalian Empire has a presence here which has recovered well to recent worldwide events and may even benefit from others. Despite this, the Fendarfelle Colonies that cling to the coastline have yet to push deep inland into the dangerous wilds filled with hostile creatures both known and unknown. Only time will tell if the Ailor spirit will tame this region’s internal geography as they have so many others, or if they will be forced to remain on the coastlines. The Seraph likely inhabited Fendarfelle in ancient times, but their ruins are scant. The likely reason for this is the series of volcanoes that erupted across the region during the Cataclysm, probably destroying what ruins existed or burying them under volcanic ash. The region was relatively unexplored before the Cataclysm as well, with only a few outposts of the Drovv civilization located there and limited exploration by the Allorn Empire. When the Fifth Void Invasion occurred, it seems that some of the regional wildlife was touched by the demonic energy, but not all were fully converted. This is primarily seen in the two species of Giant Spider, one being far more Void-touched and affected (which now resides on Drowda) while the other is simply large and might have merely been increased in size by Void energy. Regardless, within several months, the Cataclysm occurred, and massive volcanic eruptions exploded outward from the continent’s core. The plumes of ash from this event could be seen from Ithania and in nearby regions in The North Belt and compelled many to believe the region was now a wasteland. For years, people kept away from the continent, but as Ithania expanded itself its people felt the urge to travel to the nearby land. When they arrived in 200 AC, they found rich soil, plentiful minerals, and huge jungle trees waiting for them. Colonies immediately began to settle in the northeast and southwest of the Nouveau Peninsula, and the northern industrial efforts were overseen directly by the Regalian Empire while the southern efforts were more agricultural and firmly Ithanian enterprises. As time passed, the Fendarfelle Colonies became a promising new region for newcomers of all Races, though most non-Humans labored as slaves. The Bone Horror Crisis firmly brought an end to this way of life. Untouched for 300 years, the bones that accumulated over that long period formed in bestial entities both large and small. 70% of the local population was slaughtered as they poured forth from the jungles, with only the largest of the colonial coastal cities surviving and, even then, their inhabitants took a beating. They recovered from this devastation quickly though, with many thousands of Ithanian, Altalar and Regalian migrants moving into the region for various reasons. As a result, its population has dramatically recovered in a very short time and, due to recent political tensions in Ithania, continues to accept even more new members to its colonial lands. Fendarfelle sits to the far northwest of the Regalian Archipelago, northwest of Daen and west of The North Belt. The Fendar Strait separates it from the rest of Aloria as well as other bodies of water. The land itself is covered in jungles and forests, leaving no shortage of local flora to coat the landscape from the tops of trees to ground moss. The region is also very uniform, with miles of this dense foliage across the continent gradually rising from the feet of the large volcanoes that fill the core of the continent. These volcanoes are some of the largest in Aloria and some to the far northwest still occasionally erupt in violent plumes. As a result, rather than the rivers coming from these heated and often cooling peaks, they instead accumulate at their feet, running back to the coast both large and small rivers at a variety of speeds. Many also form swampy grounds and marshlands where fish and amphibious species thrive. The only territory in Fendarfelle held by nations are the Fendarfelle Colonies, which is a territory loyal to the Regalian Empire. It rests at the end of the fat Nouveau Peninsula, hugging the entire coastline. Many of the settlements have repaired the damage caused by the Bone Horror Crisis, but the outlying regions are still broken and often infested with beasts, Bone Horrors and otherwise. A large amount of natural flora covers Fendarfelle thanks to its fertile volcanic soil and unimpeded growth over the last three centuries. Some of these plants demonstrate bizarre characteristics, like the Bitter Spear, an herb with a mushroom-like tip to a grain-like stalk but medical properties. On the less unusual side is the Rundre Ash Vine, a species of vine that grows in copious amounts in the surrounding jungle of the region’s volcanoes. It is unique for its ability to glow bright red in the springtime, providing some beautiful illumination to the rocky slopes and in the jungles at night. Aside from these unique plants, Honey Balls, spread by some unknown means, exist along the northeast of the continent brought over from Drowda. Also, mundane flora like Theomar’s Fungus has been brought over with the Regalian and Ithanian settlers, alongside grape and plantation plants. Life teems on Fendarfelle in several different forms. Insect and arachnid species are the most prosperous and are also some of the largest in Aloria. This can be seen with the Fendar Rotbite, a multi-segmented and flesh-eating insect native to the region. The Giant Spider is another terrifying presence as its webs and acid make them dangerous predators to even sentient beings. There are also mammalian beasts on Fendarfelle, the most well known being the Kyanprat, a strange reptile-mammal hybrid that lurks in the region’s swamps. These swamps also contain the toxic Silver Poison Toad, whose excretions induce vomiting and stomach illness which serves as a defense mechanism against being eaten. Finally, the continent still possesses an active Bone Horror presence, the shambling masses of bones now combatting the local wildlife as well as forces from the Fendarfelle Colonies. Speaking of the Colonies, they have a variety of domesticated Ithanian animals within their borders; primarily cats, dogs, and some farm animals. Some animals in this area were also brought there against the wishes of the locals, with House Mice, Field Mice and the odd Vile Rat living among the colonists as well as small groups now escaping out into the jungle. 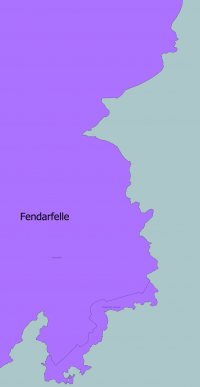 Fendarfelle, while a large landmass, has only a single official presence on it: the Fendarfelle Colonies. While they were originally an Ithanian-only mission, the Regalian Empire soon got involved and helped to add multicultural landowners and officials to the region. To the northeast are the Regalian-led colonies, mainly lumber camps and mines with a few large-scale basic farming operations set up to help sustain themselves. In the southwest are the more Ithanian lands, with Altalar, Ithanians, and Varran all co-existing and many involved in pleasure activities or the tending of vineyards. The grapes prosper greatly from the volcanic soil, producing fine wine for sale locally and beyond. It is likely that over the coming years, Regalia will continue to help push more inland to increase the land available to all parties. Fendarfelle is dominated by Ailor of several cultures. The most prominent are the Ithanian Ailor, whose vineyard operations help many a nobleman and woman pay for lavish lifestyles in the Colonies or back on their nearby home. Many more are simply hardworking laborers on these plantations or part of other agricultural endeavors. A variety of other cultures also live there; Anglians mainly on farms or near mines, Ceardians in similar conditions and several small groups of Velheim. Most exist within Regalian territory, serving as laborers, members of the military or traders. The Velheim, in particular, are there to fight, seeing the Bone Horrors as an unholy affront to the dead and a threat needing to be put down. This presence is expected to grow as more people migrate to the region to help it recover and push deeper into the continent. The Altalar never had much interest in Fendarfelle in the ancient past, but now their wealthier members flock to the region. Most come in support or in unison with Ithanian friends and business partners to exploit the natural wealth of the landscape. However, since 302 AC, many Altalar have fled to the region to avoid the Regalian Empire. While the Fendarfell Colonies are still Regalian territory, it is territory at the edge of their Empire and a place that warfare is unlikely to consume. Most live alongside Ithanians, but a few are Regalian slaves, put to work out in the logging and mining camps of the Empire. The Altalar population will likely grow as Regalia’s warfare against the Race continues in southern Daen, and if Ithania’s political problems continue. A diverse grouping of Varran call Fendarfelle home, or in some cases, prison. In the Ithanian-run regions, Sarran Varran are common in the households alongside their Warran brethren, though Warran moreso serve out in the plantations and fields as grunt workers. In Regalian controlled territory though, all of the Varran present are slaves. Again, many are Warran, but small groups of every subrace exist alongside them and the other slave groups. Their lives are hard, but they do their work admirably considering the circumstances. Varran populations are expected to grow, but only in Ithanian regions more servile Varran come in with new Ithanians and Altalar. A cluster of other Races also live in Fendarfelle. The most prominent are the Orcs, many of which serve in the Regalian military protecting the Colonies or as slaves working the lumber and mining camps in the Regalian regions. The Qadir are, surprisingly, the second largest minority present. Most have come to help defeat the Bone Horrors plaguing the region, but there is talk of founding a Hadritya in the region to study and examine the relatively unknown jungles of the vast continent. Finally, a number of Half Race slaves exist across the Fendarfelle Colonies working the fields, mines and lumber camps for their masters. All of these Races are expected to grow in population over the coming decade unless something drastic occurs once more. The seaside port town of Inoubliable-sur-Lacouseux is a beautiful riverside settlement which perfectly encapsulates the Ithanian presence in Fendarfelle. The docks are spacious, with ample room for local fishing vessels to dock alongside larger passenger and cargo ships bound for distant or nearby lands. Proceeding past the wall of harbor industry are a variety of boutiques and cobbled roads forming a downtown core of the settlement. Beyond them lies the vast majority of the region’s housing. A short wall of stone and wood then takes travelers outside of the urban center and into the plantation regions surrounding the town, filled with grapevines and other luxury goods grown using the rich volcanic soil. The estates found at the center to these lands are often small but bright jewels surrounded by green landscape. The entire town is also a popular destination for tourists and visitors, with large rentable spaces in the downtown core to accommodate visiting families alongside several recreational activities. The town is also well known to music lovers as the home of Ithanian composer Davide Demarch-Sapelle, who has his homestead within the town's borders. As a result, many musicians also live in the surrounding region and help him produce his pieces. Even if one is not chosen to help him test his compositions, the concerts held on a bimonthly basis bring the majority of musicians together anyway to produce beautiful melodies. Camp Allestrain is the largest lumber camp in Fendarfelle to be run by the Regalian Empire. While not founded under the reign of Emperor Allestrain I, the name is still deemed fitting given his physical strength and Ithanian culture, a tie to the nation and people who discovered Fendarfelle in the first place. It is a massive complex surrounded by a high wood and stone palisades, the trunk tops sharpened to a tip. The main gate leads down a central dirt avenue past a series of barracks and slave pits before ending a small roundabout. The roundabout has the central administration complex dominating one side of it and is located on the River Allestrain that runs through the entire camp, which was named by the camp founders rather than by any geographer. Out the rear of the camp are a series of small gates facing toward the jungle with dirt paths cutting through the ground shrubs. When the camp was originally founded, the entire region was surrounded by trees, but in modern times they are now only to the north of the camp. During the day, slaves are roused and put to work by the Regalian overseers. The smaller jungle trees are sawed by hand while the largest are cut down by machine and processed into smaller sections on site; all done by these slaves. The products are then hauled back into storage stacks to await transport to mills and other facilities nearby. The camp has a large Orc slave population, and so a fighting pit was specifically created to fulfill their needs during the first reign of Alexander I in 302 AC. The camp weathered the Crisis, increasing its defenses as a result and continues to accept new slaves. At the northwestern edge of known Aloria sits Mount Tressna, an inactive volcano of gigantic proportions. It is only slightly smaller than distant Mount Kelmor, which has a rim of six miles in diameter. The volcano has been inactive for over a century and, as a result, Rundre Ash Vines have crept up its base. But the real site of interest on the mountain is the lone Seraph tower angled at the volcano’s base. It is clear that exposure to lava flows have largely consumed the structure’s foundation. Despite that, it remains intact, which suggests to some scholars that the base is simply buried and not melted. It does have a shaft or staircase downward and the site does have a known Magus, observed from afar by the explorers who reached in the region in 288 AC. Fendarfelle’s volcanoes have blocked the way for any further exploration to the northwest due to their treacherous nature. The waters of the Western Calms also are hostile the further northwest one goes, giving way to wild and abrasive storms that have pushed many ships back into safer waters. Fendarfelle might be home to some of the last living Dragons. While the records are vague, the Allorn Empire mentions a species known as Mystical Dragons who were respected in Drovv society, known to take their form as well. Scattered reports from Fendarfelle mention strange, elongated creatures slipping through the dense jungles out of sight but many consider the Dragon extinct, likely obliterated when the volcanoes at the core of the continent reduced the landmass to a wasteland for several decades. This page was last edited on 9 February 2019, at 11:22.